In the middle of the sixth century, the world's smallest organism collided with the world's mightiest empire. With the death of twenty-five million people, the Roman Empire, under her last great emperor, Justinian, was decimated. Before Yersinia pestis, the bacterium that carries bubonic plague, was finished, both the Roman and Persian empires were easy pickings for the armies of Muhammad on their conquering march out of Arabia. In its wake, the plague - history's first pandemic - marked the transition from the age of Mediterranean empires to the age of European nation-states - from antiquity to the medieval world. 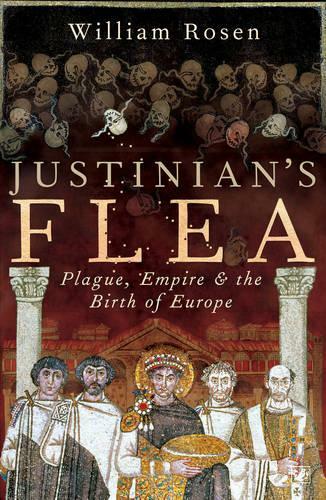 A narrative history that melds contemporary sources with modern disciplines, Justinian's Flea is a unique account of one of history's great turning points - the summer of 542 - revealed through the experiences of the remarkable individuals whose lives are a window onto a remarkable age: Justinian, his general Belisarius, the greatest soldier between Caesar and Saladin; his architect, Anthemius who built Constantinople's Hagia Sophia (and whose brother, Alexander, was the great physician of the plague years); Tribonian, the jurist who created the Justinianic Code; and, finally, his empress Theodora, the one-time prostitute who became co-ruler of the empire, the most politically powerful woman in European history until Elizabeth I.